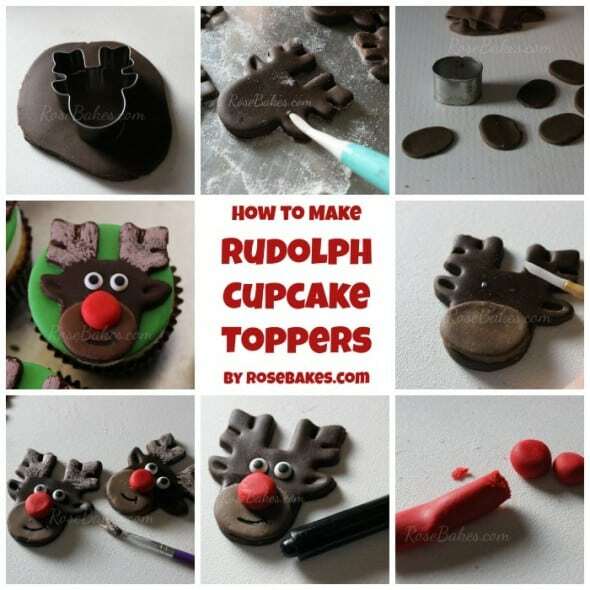 I know it’s getting awfully close to Christmas to be sharing a tutorial like this but I’m going to share anyway… How to Make Rudolph the Red-Nosed Reindeer Cupcake Toppers. Brown, red, white and green fondant. I use Satin Ice Dark Chocolate Brown Fondant, Satin Ice Red Vanilla fondant and homemade marshmallow fondant for the white and green (colored with Leaf Green gel coloring). 1. 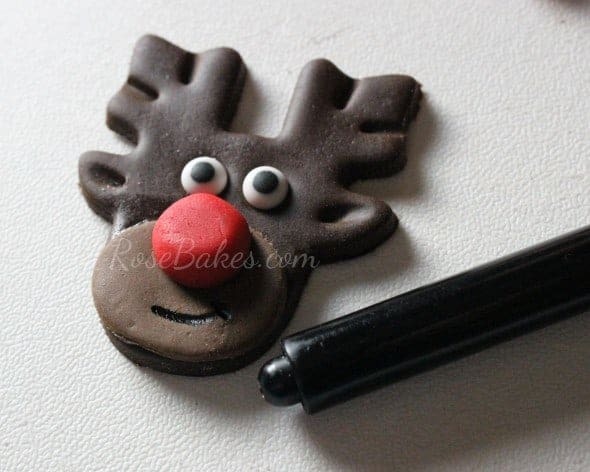 Roll out the brown fondant and cut out the reindeer shapes. 2. 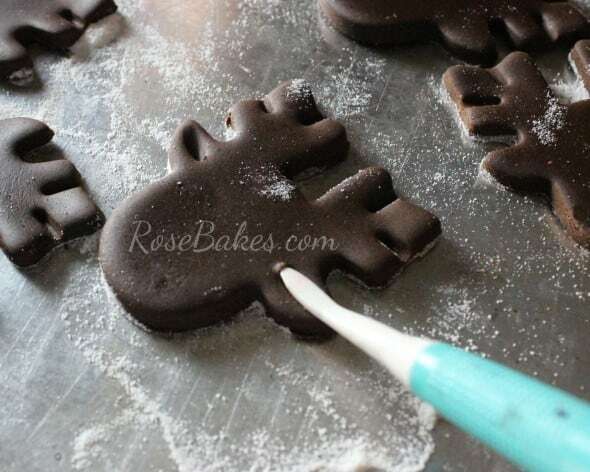 Using the end of a small paint brush or a gum paste tool, make impressions in the antlers to give them some dimension. 3. I don’t know the specific name of this tool, but it has a sort of teardrop shape – it’s in the Wilton Gum Paste tools set… use the fatter end to make the impressions for the ears. 4. Mix a small amount of white into some brown to lighten it. Roll it out thin and cut out ovals for the “nose” area of the reindeer. Use a cutter that fits on the bottom part of the deer’s face. 5. Use a small amount of sugar glue to attach the nose to the deer. Also dot a spot for the deer’s eyes and nose. 6. 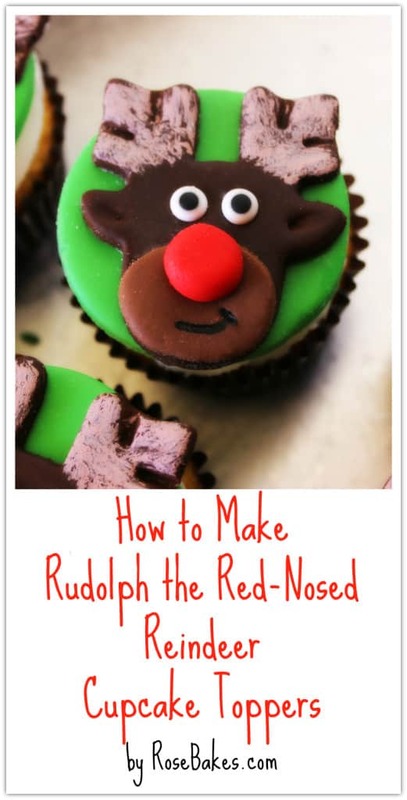 Roll out small balls of red fondant for the Rudolph’s nose. Attach the nose and eyes to the dots of sugar glue. 8. 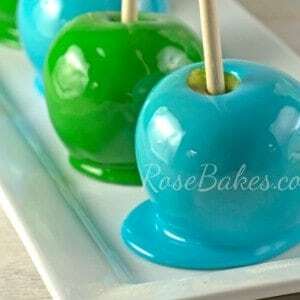 In a small bowl, mix together a small amount of white and brown gel colors. Using a small paintbrush, roughly paint the antlers. I like to leave them a bit messy. 9. You could let the deer dry as they are and use them directly on frosted cupcakes, but I rolled out some green fondant and cut out 2″ round circles and attached the deer to the green background. I placed them on a cookie sheet sprinkled with tylose and let them dry overnight. If you’re curious… the cupcakes were vanilla cake with vanilla buttercream. 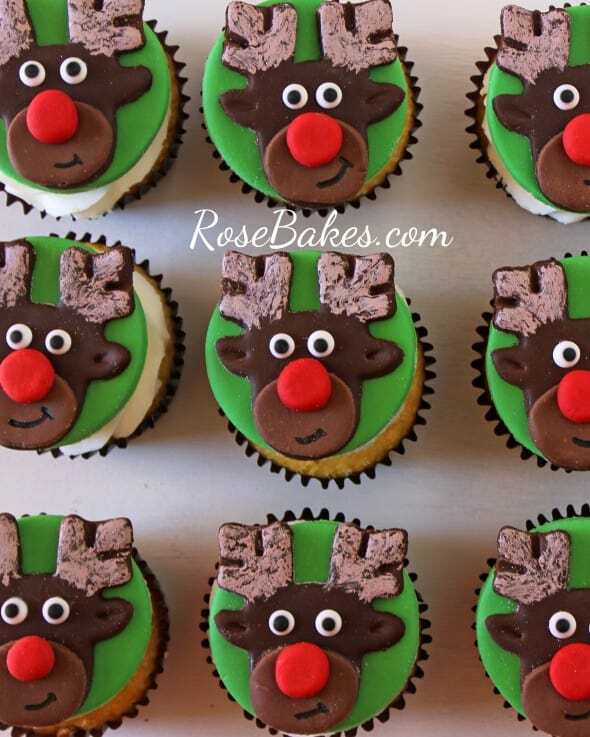 And that’s it… do you have any questions about how to Make Rudolph the Red-Nosed Reindeer Cupcake Toppers? Leave me a comment! These are so adorable!! Great job! Thank you! Merry Christmas Amanda!